"Looking a little long in the tooth" used to be a saying to politely describe an older person. This was because receding gums--a sign of advanced periodontal disease--were very common. They phrase may have fallen out of favor, but peridontal disease remains a serious public health threat. The National Institutes of Health reports that 20 percent of older Americans have lost their teeth due to periodontal disease. 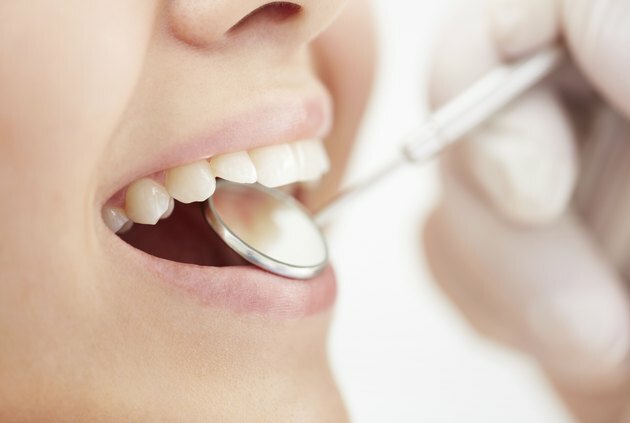 If you have receding gums, talk to your dentist and doctor about treatment options. In addition, several vitamins may benefit receding gums. Our bodies make vitamin D largely from sun exposure, hence vitamin D's nickname as the "sunshine vitamin." Unfortunately, the average adult in the United States spends nearly nine of every 10 hours indoors, the EPA reports. Without supplementation or adequate sunlight, vitamin D deficiency is almost certain, claims the Vitamin D Council. Vitamin D can help reduce the risk and severity of periodontal disease, the American Academy of Periodontology reports. Adequate vitamin D levels keep inflammation under control. If inflammation in the gums gets too high, it's more difficult for your immune system to fight the infection that's causing peridontal disease. The Vitamin D Council recommends 5,000 International Units of vitamin D per day. People who don't acquire enough vitamin C are at heightened risk of periodontal disease, according to a study in the June 2013 issue of "Journal of Dietary Supplements." Vitamin C works on two levels to protect your receding gums from further damage. First, it shields the gums from damage caused by harmful compounds known as free radicals. Free radicals are created during metabolism and destroy healthy tissue. Vitamin C can sequester and destroy free radicals before they damage the gums. In addition, vitamin C is an important component of the connective tissue collagen. Collagen is the glue that holds your gum cells in place. Eat at least 75 milligrams of vitamin C per day in food or supplement form. Food sources of vitamin C include tomatoes, red bell peppers and orange juice. B complex vitamins play a number of important roles in gum health. Importantly, B vitamins are necessary for the production of new gum tissue, the American Dental Hygienist Association reports. The B vitamins include folic acid, B-12, B-6, riboflavin, niacin, pantothenic acid and thiamine. Sources of B vitamins include fortified grains, fresh vegetables and fruit. However, vitamin B-12 tends to be found in animal products, especially red meat.